Texas chili purists may not agree that this recipe qualifies for its name. But the main ingredient is beef, there are no beans and no tomato, so I think it has to at least land somewhere in the range of authentic Texas red. I actually prefer beans and tomatoes in my chili, but this alternative version made my self-professed bean hater boyfriend happy, and it was a very good version of chili that I'll make again. 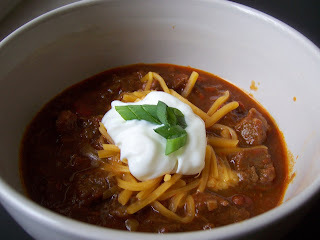 Hot but not fire-hot and with a touch of sweetness, this is a meat lovers chili. Brown beef in olive oil over medium high heat. 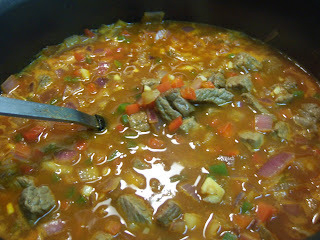 Add peppers, onions and garlic and cook until they begin to soften. Add chili powder, cumin and salt and pepper. Add sugar and cinnamon and stir well to disperse spices. Add water and beer and bring to a boil. Reduce heat and simmer. 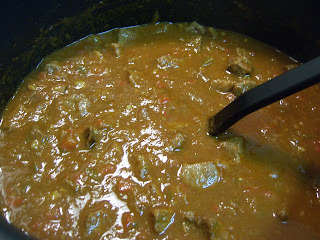 Simmer for about 2 hours loosely covered until beef is very tender and the sauce has thickened. You can adjust seasonings as you go. Serve with grated cheese, sour cream, green onions, jalapenos, tortilla chips or tortillas or whatever you prefer! Well, I have no ties to Texas, but cinnamon, chili, brown sugar, and beer sounds dynamite to me. Looks delicious! My husband would LOVE this! He doesn't like chili because he doesn't like beans and isn't a fan of tomatoes. This would be the chili for him! Thanks for sharing the recipe.